The Holocaust establishment is intellectually and historically deteriorating. The reason is simple: you either ally with the truth or the truth will eventually break you. Steven Spielberg is an interesting film director and ideologue. 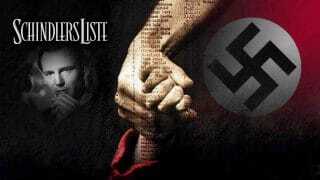 He has directed movies such as Schindler’s List and Amistad. These propaganda films have almost certainly changed the way people think about the so-called Holocaust and slavery in America. Both movies are dazzlingly powerful and culturally alluring, but both films are based on historical myths and fabrications. “The Amistad case revolved around the Atlantic slave trade — by 1840 outlawed by international treaty — and had nothing whatsoever to do with slavery as a domestic institution. Let’s start with Amistad. Spielberg never told his movie goers that the slavery business in America was an essentially Jewish enterprise. We have exhaustively documented this in numerous articles. To direct a movie which shows that Jewish businessmen were at the center of the slavery business would ruin Jewish manipulation of blacks in America, so Spielberg puts the blame at the feet of Europeans, the very people who single-handedly abolished slavery in the Western world. Since Spielberg is a Jewish ideologue, which is to say that he espouses some form of Jewish messianic vision of the world, he has to perpetuate lies and fabrications as historical truth. And since he now holds much of the film industry on the palm of his hand, he has to spread the Holocaust gospel, which deliberately excludes every tragic event Jewish radicals like Lenin and Marx have ever invented. Perhaps they hadn’t even heard of the Holocaust because the story itself is fraught with puzzlement rather than historical fact and anyalysis. Perhaps it is one reason why people are being jailed in Europe for even questioning certain aspects of the story. Perhaps this is one reason why Monika Schaefer is behind bars in Germany right now. Perhaps this is one reason the thought police and the Holocaust establishment are currently stalking Monika’s brother, Alfred. “In a strange way my life has always come back to images surrounding the Holocaust. The Holocaust has been part of my life, just based on what my parents would say at the dinner table. We lost cousins, aunts, and uncles. So Spielberg is not really interested in the peasants who got exterminated by Lenin and Stalin. Keep also in mind that Stalin liquidated more than ten million peasants long before rise of Hitler. Moreover, Spielberg wouldn’t dare to include Mao’s great famine into his story because Mao, using the Bolshevik ideology (which was largely a Jewish movement), liquidated at least forty million Chinese. Spielberg wants to focus on Nazi Germany because he and his brethren think that the so-called Holocaust is unique. Jewish scholar Jacob Neusner declared that “the Holocaust…was unique, without parallel in human history.” Daniel Goldhagen made similar claims in his book Hitler’s Willing Executioners. French Jewish historian Pierre Vidal-Naquet espoused similar views. Many Jewish writers indirectly advocate this form of doctrine in one way or another. For Deborah Lipstadt, downplaying the “uniqueness” of the Holocaust is to be a Holocaust denier. “The brutal Armenian tragedy, which the perpetrators still refuse to acknowledge adequately, was conducted within the context of a ruthless Turkish policy of expulsion and resettlement. It was terrible and caused horrendous suffering but it was not part of a process of total annihilation of an entire people. That’s the type of argumentation that these people are trying to spread. They don’t care about what the Allies did to German and Japanese civilians after World War II; in fact, they don’t give a damn about those innocent people. They want to force the so-called Holocaust down everyone’s throat, whether people like it or not. Thankfully, people are waking up. The Holocaust establishment is intellectually and historically deteriorating. The reason is simple: you either ally with the truth or the truth will eventually break you. Noah Berlatsky, “12 Years a Slave: Yet Another Oscar-Nominated ‘White Savior’ Story,” Atlantic, January 17, 2014. For those who are interested, see for example: https://www.veteranstoday.com/2013/04/18/the-problem-of-slavery-in-western-culture-part-i/; https://www.veteranstoday.com/2013/05/12/jewish-slavery-in-western-culture-part-iii/; https://www.veteranstoday.com/2013/04/22/jewish-slavery-in-western-culture-part-ii/. “Steven Spielberg urges mandatory Holocaust education,” Jerusalem Post, April 29, 2018. Joseph McBride, Steven Spielberg: A Biography (Jackson: University Press of Mississippi, 2010), 43. See Robert Conquest, The Harvest of Sorrow: Soviet Collectivization and the Terror-Famine (New York: Oxford University Press, 1986); Jean-Louis Panné and Andrzej Paczkowski, The Black Book of Communism (Cambridge: Harvard University Press, 1999); Steven Rosefielde, Red Holocaust (New York: Routledge, 2010). Frank Dikötter, Mao’s Great Famine: The History of China’s Most Devastating Catastrophe, 1958-62 (London: Bloomsbury Publishing, 2010). Quoted in Norman Finkelstein, The Holocaust Industry: Reflections on the Exploitation of Jewish Suffering (New York: Verso, 2000), 42.